Jackson, located in central Mississippi, sits at the junction of the Pearl River and the Natchez Trace, a trade route that predated the arrival of European colonists by thousands of years. In the 1700s, the French-Canadian trader Louis Lefleur established a trading post in present-day Jackson. The site, known as Lefleur’s Bluff remained part of Choctaw territory until 1820, when a treaty opened the area to Euro-American settlement. Shortly thereafter, Mississippi’s state legislature established a new state capitol nearby and renamed the town after Andrew Jackson, the future president. The city served as a steamboat port and then a railroad center and, despite its destruction during the Civil War, grew into a hub for education, medicine, commerce, and state government. Jackson attracted Jewish settlers from Germany and Alsace-Lorraine in the 1850s and from Poland in the 1870s and 1880s, many of whom were merchants. The Jewish community in Jackson has continued to grow in the early twenty-first century, thanks in part to residents who migrated from other parts of the country to work at the medical center, local colleges, and for the state government. It is currently the largest Jewish community in the state. The first Jewish organization in Jackson was founded in 1860, when local Jewish merchants bought land for a future Jewish cemetery on North State Street. The next year, fifteen families formally organized the Beth Israel congregation. The congregation met in a one-story schoolhouse on South State Street and started the first Jewish day school in Mississippi. At the time, state public schools were nonexistent. The congregation began as a traditional Orthodox group—in need of a teacher, chazzan, and shochet for kosher meat—but joined the Reform movement by 1875. In 1874, the wooden building that housed the congregation burned down. It was replaced by a new brick building in 1875. Beth Israel remained on South State Street until the 1940s, when they moved to Woodrow Wilson Drive to be closer to home for the congregants. Twenty years later, the congregation moved to follow its members again, to Old Canton Road in northeast Jackson. Unlike many other cities, there was never more than one congregation in Jackson. Jews were an important part of Jackson's merchant class. Early Jewish settlers in central Mississippi included Benjamin Hart, John Hart, Lazarus Kahn, Isadore Strauss, Aaron Lehman, and H. Goodman. Most of Jackson’s earliest Jewish residents owned businesses in downtown Jackson. At one time, Capitol Street was home to 16 Jewish businesses, none of which exist today. Three of the buildings remain as of 2018—the Cohen Building, Jackson's Federal Building (formerly Harry Herman's men's store, The Hub), and the United States Bankruptcy Court building (formerly Millstein's dry goods store). The Cohen Building was the home of Cohen Brothers clothing store. In 1889, 15-year-old Moise Cohen came to Jackson from Romania to join his brother Sam in the clothing business. For almost a century, the Cohen Brothers’ clothing store served customers on Capitol Street. Other Jewish-owned downtown businesses included Mangel's (owned by the Horowitz family), Vogue (owned by the Gordons), Lefkowitz Jewelry, and a farm supply store owned by the Ascher family. In the 1920s, Jackson’s leading department store was The Emporium, located on the northeast corner of Congress and Capitol streets. Its owner, Simon Seelig Marks was a member of the Kiwanis Club as well as director of the Mississippi Merchants Association and vice president of Jackson’s Chamber of Commerce. He was married to Josephine Hyams of Jackson. During the Great Depression, Marks was also the state director for the National Emergency Council. The Emporium itself sold a wide range of dry goods merchandise, including victory war bonds during World War II. 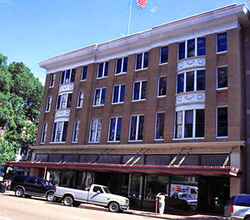 Although long since closed, the building was restored in 1988, and it is listed on the National Register of Historic Places. Jews were also involved in the apparel cleaning business in Jackson. Near the turn of the century, Isidore Lehman began his career in Jackson as a shirt washer in a cart for a Memphis laundry company. He eventually became partner and owner of Jackson Steam Laundry. Located on 730 State Street, the company was known for the slogan, “When clothes are dirty, 730.” Lehman’s business not only cleaned clothes, but it also served as a bathhouse for people without running water. As Lehman found financial success, he also contributed to Jackson’s civic life. He was president of numerous organizations including the Jackson and Mississippi Chambers of Commerce as well as Beth Israel synagogue, Hinds County Red Cross, and the local school board. Jackson Steam Laundry closed in 1960s, and the building was demolished in the 1970s. 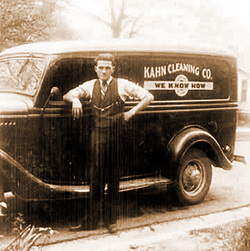 Another local, Jewish-owned cleaning business, the Gardner and Kahn Cleaning Company, opened in 1924. It operated as “Kahn Cleaning Company” until the 1980s. ​Other Jewish businesses in early 20th-century Jackson included Jake Ehrman’s meat market (1890 to 1920) and August Hatry’s Jackson Transfer Company. As Jackson Jews established themselves in business, they also invested in real estate. In the economic uncertainty that followed the Civil War, many Jews saw an opportunity to purchase cheap land. John Hart (formerly Hertz) was one of these buyers. In the 1850s, Hart had been a poor immigrant making $10 a month in a butcher shop, but, after serving the Confederacy in Company A of the 6th Mississippi Brigade, Hart used land purchases to increase his wealth and formed J & B Hart Company in 1866. Joseph Ascher was another real estate success. Born in Alsace in 1855, he came to Jackson to live with his Hart relatives and find a better life. He began his career in the U.S. as a simple peddler but became a real estate tycoon by the end of his life. He also served on the Jackson School Board, embodying Jackson Jews’ commitment to civic engagement. Isadore Dreyfus supplemented his income from his successful insurance business by owning land. Many Jackson Jews found ways to give back to the community. During the Great Depression, the Lehman family served breakfast to hungry children who attended the school across from the family's home. Aaron and Celestine Lehman started a home for elderly women in Jackson, and Aaron was a faithful school board member. Celeste Lehman Orkin, Isidore Lehman's daughter, was committed to preserving Jewish life in the Deep South, and helped found the youth movement for Jewish children in the area in the 1950s. She was also the guiding force in the creation of the Henry S. Jacobs Camp in nearby Utica, Mississippi. In 1991, Susan and Macy B. Hart were among the founders of Parents for Public Schools, an initiative which began in Jackson and now serves the entire country. In the early 2000s, Josh Wiener and Jonathan Larkin served on the Jackson School Board, expressing their commitment to public education at a time when most white parents in the city enrolled their children in private schools. Jews have participated in Jackson’s social and economic development as businesspeople and civic leaders. Historically, most worked to acculturate into white southern culture, dropping dietary laws and strict Shabbat observance. Although they tended to be more progressive on racial issues than their white Christian counterparts, they generally accomodated themselves to the systems of segregation that structured everyday life. Consequently, most Jews succeeded at becoming an accepted part of Jackson’s white middle class. Their successes were announced in newspaper articles, and their building dedications and other celebrations were attended by Christian ministers and local and state political leaders. Jewish Jacksonians were allowed in many clubs, including the Masons and the Odd Fellows. Still, some Jews complained that they were never accepted into certain circles of Jackson's elite white society. The most glaring incident of anti-Semitism in Jackson occurred during the turbulent civil rights era. Rabbi Perry Nussbaum came to Jackson and began to speak out in favor of civil rights. Some local Jewish merchants agreed with the rabbi, yet were too afraid to speak out publicly because of threats of retribution. Nussbaum was deeply involved in interfaith work, and was active in the Mississippi Religious Leadership Conference and the Jackson Clergy Alliance. He was also a member of the Committee for Concern, which helped African American churches to rebuild after they had been attacked or burned. Nussbaum drove to Parchman State Prison in the Delta each week during the summer of 1961 to visit and lend moral support to the Jewish Freedom Riders from the North. 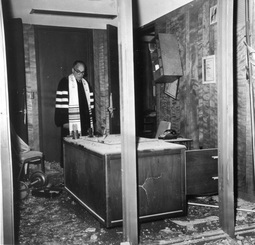 On the night of September 18th, 1967, a group of Ku Klux Klan members planted a bomb which destroyed much of the Rabbi’s office and part of the library. Although no one was hurt, this would not be the end. Two months later, the same Klan members bombed the Nussbaum home while the rabbi was home with his wife. Miraculously, again, no one was hurt. Later, the same Klan group bombed the temple in Meridian, Mississippi and were later captured by the police when they tried to bomb the home of a Jewish leader in Meridian. In response to the bombing of the Nussbaum home, 42 clergymen and sympathetic citizens joined in a “walk of penance” to Beth Israel, where they held a Thursday night vigil, which attracted a crowd of 150 people, most of whom were not Jewish. Local newspapers and state officials denounced the attacks and expressed support for Beth Israel. In some ways, the attacks were a turning point, as many white Jacksonians finally realized that the violence of massive resistance had gone too far, and it was time to change. In some cases, Jackson Jews have been in the forefront of social change. In 1968, a full page ad ran in Jackson’s daily newspaper calling for healing the racial tensions in the city and the state. It declared that all citizens, regardless of race, should receive equal treatment under the law and that there was no place for hatred or violence in Jackson. The ad was signed by numerous civic and business leaders of the city, including most of the city’s Jewish merchants. 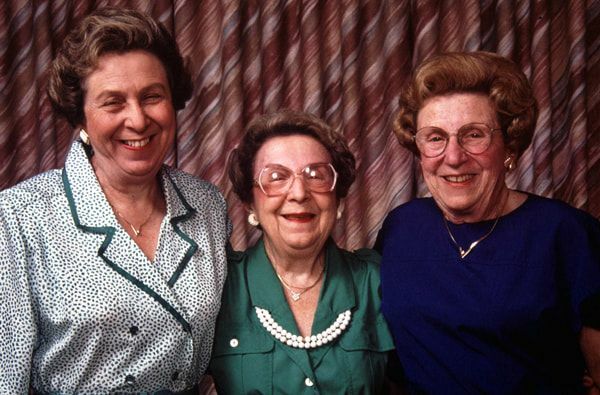 The Lehman sisters. Photo by Bill Aron. ​​While many other southern Jewish communities have experienced decline, Jackson’s Jewish population has remained stable in recent years. In 1937, 235 Jews lived in Jackson. Today, there are over 600 Jews in the metro area. While most young Jews do not return to Jackson after college, new families continue to move to Mississippi’s capital, which is currently home to the largest Jewish community in the state. The Institute of Southern Jewish Life, founded in 2000 and based in Jackson, has attracted new Jewish residents to the area—both education fellows, who usually stay for two years and often teach in the religious school, and also a handful of young families. From their early days as merchants to today’s educators, doctors, and lawyers, the Jewish community remains a small but significant presence in this part of the Deep South.